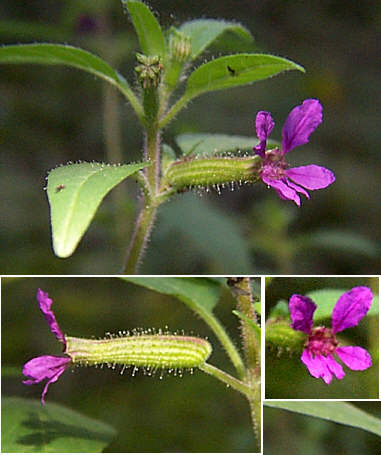 Cuphea viscosissima flower. © Daniel Read. www.2bnthewild.com (Accessed 2/2018). Cuphea viscosissima is an annual herb 15-60 cm tall , stem woody, sparsely branched, all parts sticky-hairy. Leaves opposite, egg to lance-shaped, 2-5 cm long, long-stalked. Flowers red-purple, 6-parted, irregular with a sticky-hairy tubular base to 1 cm long, 1-2 in upper axils, petals narrowed at base, largest ones 0.8 cm, blooms July-Sept.
Fruit dry, a capsule, splitting open to release seeds.